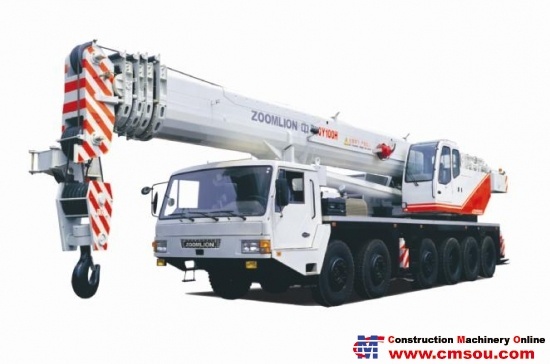 QY100H-3 truck crane，the 3rd generation of 100t truck crane introduced by Zoomlion recently，has represented the most advanced technology level in heavy-duty truck crane in China. It boasts such advantages as elegant appearance, graceful composition and compact structure as well as outstanding performance owing to the wide application of new concept, new material, new manufacturing technique and updated technology. 1.6-axle special chassis with a full-width driver’s cab; 12×6 drive, 3 axles for steering and 3 axles for driving. 2.Benz electric spray engine is applied, which not only possesses such advantages as strong horsepower, low noise and low oil consumption, but also complies with the EU Ⅲ emission standard. 3.The hydraulic torque converter and transfer case of high-performance, together with imported electrically controlled ZF gearbox which can carry out gear-shifting automatically, have improved the reliability of chassis greatly and made the vehicle drive more easily and comfortably. 4.The platform rimmed with aluminium alloy leaves a good impression on the customer for its exquisite appearance. üEquipped with adjustable, reliable and comfortable seat, anti-ultraviolet radiation curtain and cooling A/C as well as heater, the operator's cab can offer wide vision and comfortable operating environment for operator. üLarge screen color display can display the working conditions clearly and accurately and the control levers are operated with great facility. The applied powerful Benz engine is of high-efficiency and energy-saving. Besides, it complies with the EU II emission standard. üThe dodecagonal main boom with 5 sections can reach 50.4m long, which is 2.4m longer than that produced by manufacturer in the same trade. The maximum lifting height of main boom combined with fly jib can reach 69.3m. üThe boom is made of 960 steel material imported from Sweden. 4. The movable counterweight can be fitted and removed directly by the counterweight lifting cylinder, which makes the operation more convenient and reliable. Therefore, various working requirements can be satisfied. üAll actuating elements are controlled by advanced load sensing variable pump and pilot proportional control hydraulic system, which can optimize the control system of the whole vehicle and coordinate the movements of each mechanism so as to achieve the purpose of energy-saving and reliability. üThrough the PLC program controller, the electric control adjusting system applied to main pump can not only prevent the engine from being overloaded and avoid engine shutdown due to overload, but also adjust the working speed of each actuating element precisely to make the system work accurately and reliably. üAll hydraulic valves and actuating elements are imported from international famous manufacturers, and the hydraulic pipes are composed of bite type fittings and refined hard-drawn seamless tubes. Therefore, the reliability of our products has been improved dramatically. üThe two-section outrigger beams, which are electrically controlled, can be operated on both sides of vehicle. In addition, they are fitted with lighting lamps which can facilitate the operation of outriggers at night. 1. The reliable automatic pressure-inflating device can prevent the lifted load from sliding down when hoisting mechanism stops working so as to guarantee safe operation. 2. The hydraulic lock is mounted on the side, which can avoid its collision with the heavy load during operation and guarantee safe operation. 3. The load moment limiter, like black box, can effectively monitor the condition of crane and record the parameters in corresponding working condition so as to analyze faults and then eliminate them in time. 4. The crane is fitted with other safety devices such as main boom angle indicator, suspended hoisting limiter, hook safety catch and wire rope overlowering limiter. Deformation of boom is not taken into consideration. Changsha Zoomlion Heavy Industry Science & Technology Development Co., Ltd.
Side hydraulic luck, avoiding heavy crash during the operation, ensures security. Longevity of service for the anti-slew steel wire, ensures the security of the lifting. Automatic moment limiter has the function of self testing and alarming. 2、The slider with national patent, flexible operation, logical strength distribution. Strong lifting capability. 1、Supercharged inter-cooled engine, capable for working at place over 4500 meters altitude. 2、International dominant variable amplitude mechanism, to make the mast close or leave the machine in parallel. 3、Three section, foldable, box shape design mast, with outstanding intensity and strength. 4、The hydraulic system is efficient, energy saving, accurate on the ratio operation, load transmission, load sensitivity control.